Hi, is it possible to have a late submission (today) of my game, please? Nice game, I haven't expected so quite a lot of content there. Good job! Pozdrawiam fana asteroidów! :) Nie miałem jeszcze okazji zagrać w Twoją grę ale niebawem spróbuję. Hi, I'm getting "There was an error with your request" when trying to open my notifications page at https://itch.io/notifications. Congratulations on winning the jam! My life is never going to be the same after playing this game. The graphics effect is quite distracting but I like the idea. My brain hurts because of the noise in the background. Nice retro feeling though! :-) I've got a feeling that ball physics, when it hits the paddle or walls, could be a bit better. 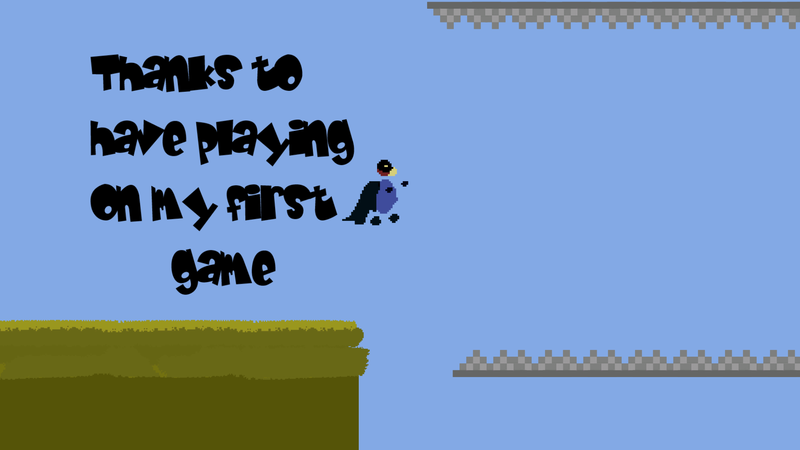 That's the best platformer I've played today ;-) +1 for the sense of humor! Thanks for your feedback! You're both definitely right it's too hard currently and 672 sounds like a nice score :-) I've just tried your Stroids (https://mugsgames.itch.io/stroids) - really love the CRT-style graphics.